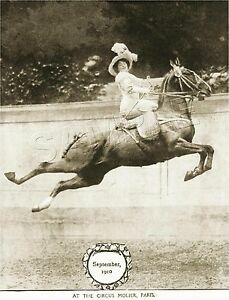 Edition Size: 8.5" x 11"
"Circus Equestrienne Riding Sidesaddle ". It is surely an unusual and collectible print for anyone who appreciates antique era photographs. The original photo was taken in 1910 as the Circus Molier inset on the photograph itself displays. Wow! What a neat picture. Love the canvas too. Thank you!! Great item---A+Deal !! Thank You ! Very Happy With !! !